Before you start using any kind of product, it is always good to know what the product consists of and what it contains because this way, you know exactly what you are using. When it comes to electronic cigarettes, they are very simple devices that manage to do a lot for their users. They usually consist of a mouthpiece, a battery (that is rechargeable and that has electronic circuits) and a heating element. As you can see, there are not that many components, but they all work together using a very simple mechanism which is also used in many places for special effects. A mouthpiece is better known as the cartridge and it is located at one end of the device. It is located at the end which you put into your mouth and that is probably how the component got its name. There is also a small cup (usually made of plastic) in the cartridge which contains a liquid solution that it is transformed into vapour and inhaled. There are two types of these cartridges – those that are refilled and those that should be replaced. The liquid solution or e-juice, which is how people like to call it, contains a certain dose of nicotine or it contains no nicotine at all. Different doses that are available are usually categorized as zero, low, medium and high. As the names themselves suggest zero doses don’t contain nicotine while high doses contain a lot. Apart from nicotine, the main ingredient of the solution is usually vegetable glycerine, which is hypoallergenic. This is not some kind of new and controversial substance. On the contrary, it is used in many different products that are sold in the USA. Glycerine can be found in toothpaste, products designed for skin care and hair care, soaps, shaving products, cough syrups and many others. The solutions also come in many different flavours, which is something that users are quite keen on. Another part of e-cigarettes is something called the atomizer, which is an element used to heat the liquid. The process makes the liquid vaporize so that the users can start smoking and inhaling the vapour which is odourless, non-toxic and thus safe for the environment and for the health of the users. This component will not last forever because it is supposed to be replaced with another one, about twice a year. The battery is rechargeable and its life span depends on its type, size and how often it is used. Logically, the more often it is used, the less it will last, but there are batteries which can last for quite some time even if they are used quite frequently. 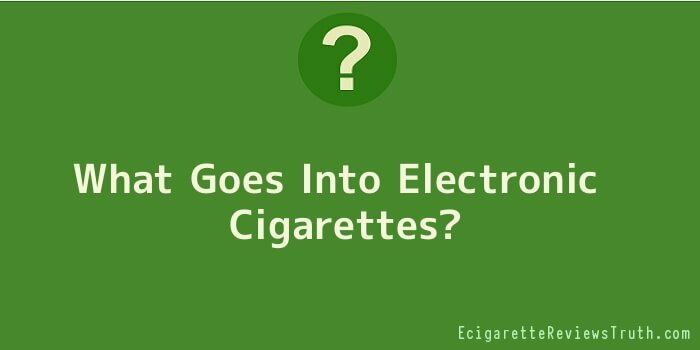 The battery is usually the biggest component of an e-cigarette and it also contains electronic circuits that are used to make the tip of the cigarette glow. And finally, some types of electronic cigarettes contain a small button that should be used whenever a person wants to smoke. The button serves as the trigger of the process of turning the liquid into vapour. If there is no button, this means that there are usually sensors that will trigger the process automatically once a person puts the cigarette in their mouth and starts inhaling. All in all, e-cigarettes are very simple and all the components were designed to make the process enjoyable. One of the most important things about them is that they are safe and people can enjoy them in all kinds of places without having to worry about whether smoking is banned or not.